Um…did somebody say horseradish?!?! Because when I hear (see) that word, I’m pretty much sold on the idea before I even know what the rest of it is! My first memory of anything horseradish-y was sometime in my childhood (err…teen years, perhaps?) at Arby’s with their amazing Horsey sauce. If you haven’t tried it, you’re missing out! After that whenever I would hear that a dish had something with horseradish in it, I wanted to try it. Right then and there. And not much has changed. The moment I saw this recipe, I knew I had to make it, ASAP! It doesn’t hurt that we love salmon, too. This is a dish that will definitely not disappoint, and you can adjust the amount of horseradish to your liking. I’m more prone to adding more than a recipe calls for because I like that extra bite to my food. If you don’t, you can decrease the amount a little. And, this is another dinner you can have on the table in under 30 minutes. Done and done! ***Note: I’ve had a few people comment on the amount of oil used in this recipe. I know it’s a lot, and I even cut it down from the original recipe. Here’s the thing…it worked for me, but if it seems like too much for you, cut it back! Use 1/4 cup and add from there if you’d like. 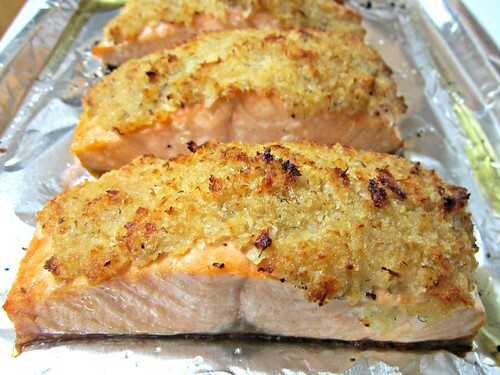 The idea is that the panko soaks it up and then gets crisp when baking. Use your best judgement – I don’t want any fires started in ovens because of oil overload. 1 and 1/2 cups of olive oil is WAY too much! This may have been a typo?? I will do this again, only not really following the amounts listed in this recipe. Krystal – I'm sorry if you felt it was too much olive oil, but that is the accurate amount. Actually, the original recipe called for 2 cups and I reduced it to 1 1/2 cups. Okay, this really is too much oil. I followed the recipe, but I had to take the pan out of the oven because I was terrified I was going to start a grease fire. Idk how you managed with 1 1/2 cups with your oven at 475. Alexandria – I’m truly sorry you had such a difficult experience with this. I understand that it is a lot of oil, but if you click the link to the original recipe it uses even MORE oil than I did. Of course make adjustments as needed for yourself and your safety!